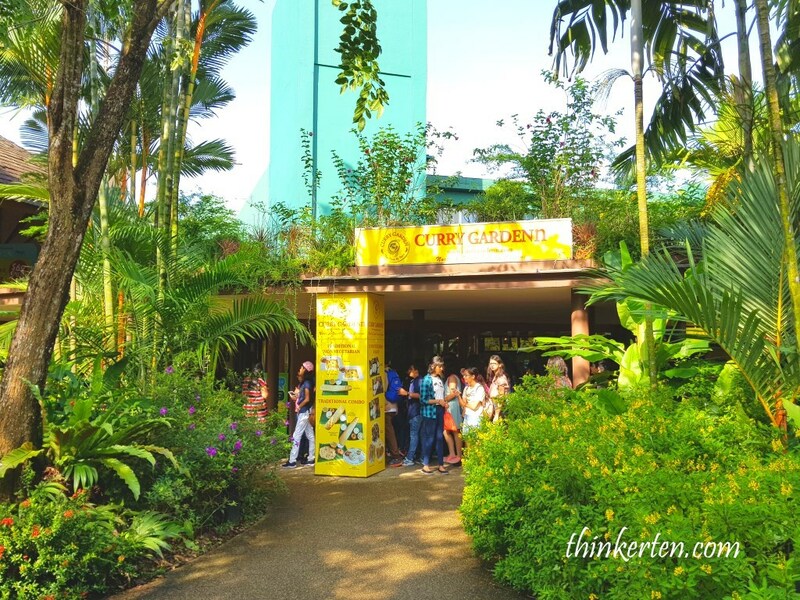 I recently re-visited Jurong Bird Park on the first week of school holiday simply to take a look before it get re-located to Mandai nature precinct. 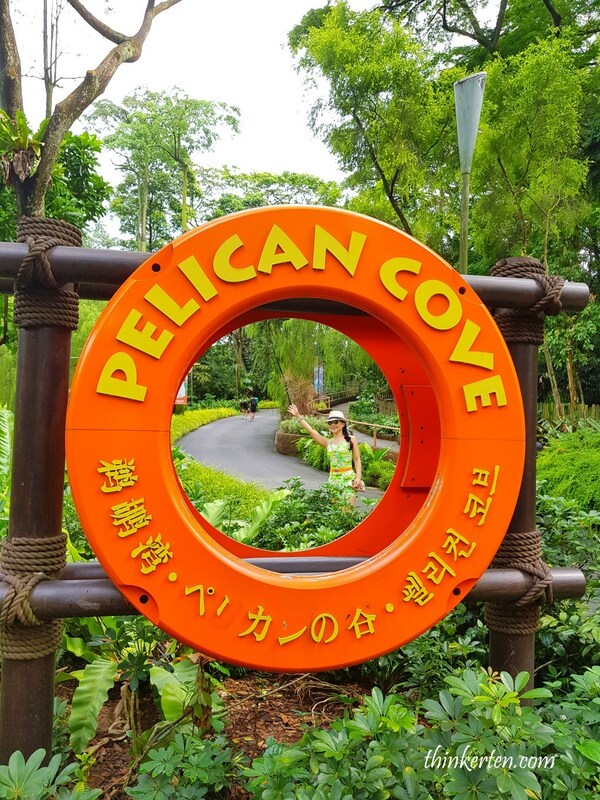 This is an iconic tourist attractions which is home to 5,000 birds from more than 400 species. And yes, the most important highlights are the two bird shows which you should not miss. 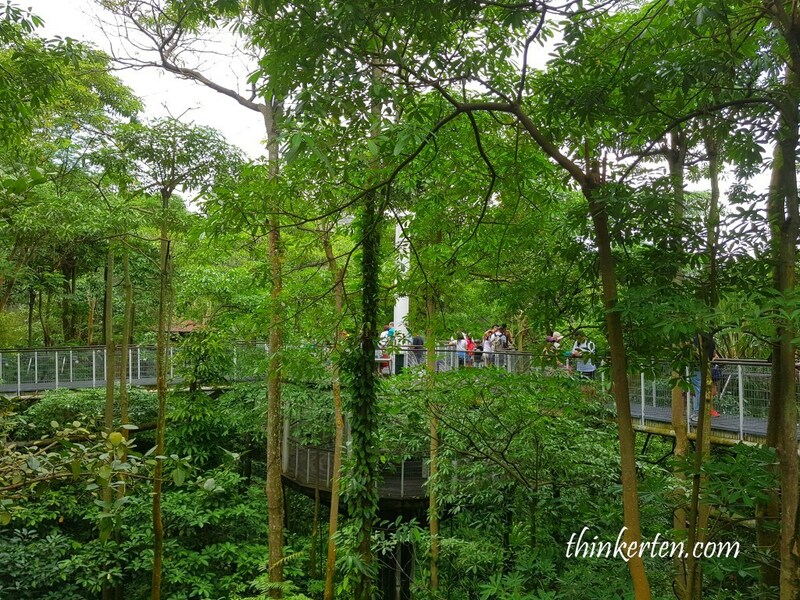 And my personal favorite is Lory Loft, a nine storeys high, world largest walk-in flight aviary for colorful lories and lorikeets with over 1,000 of them free-flying around you where you can get up-close with them. 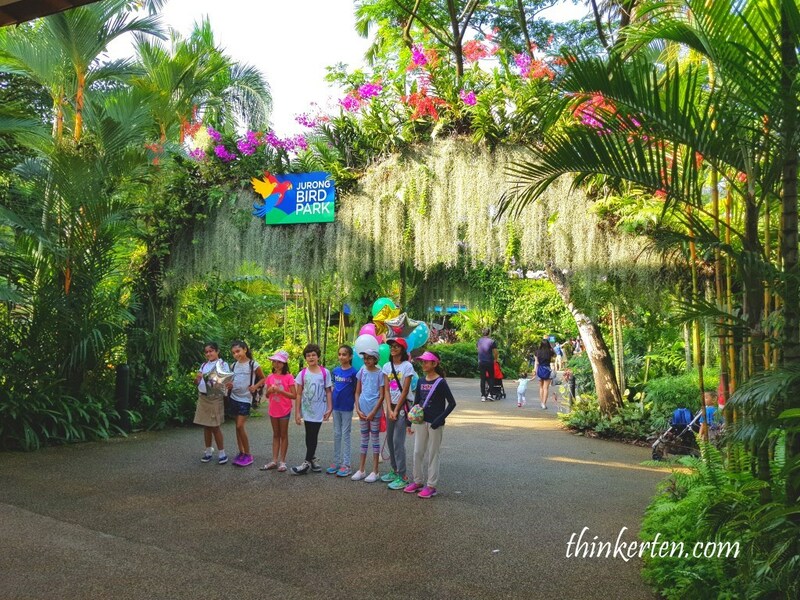 It is always a great idea to plan the kid’s birthday party at Jurong Bird Park, let the young children to play under the sun and get close to the nature! 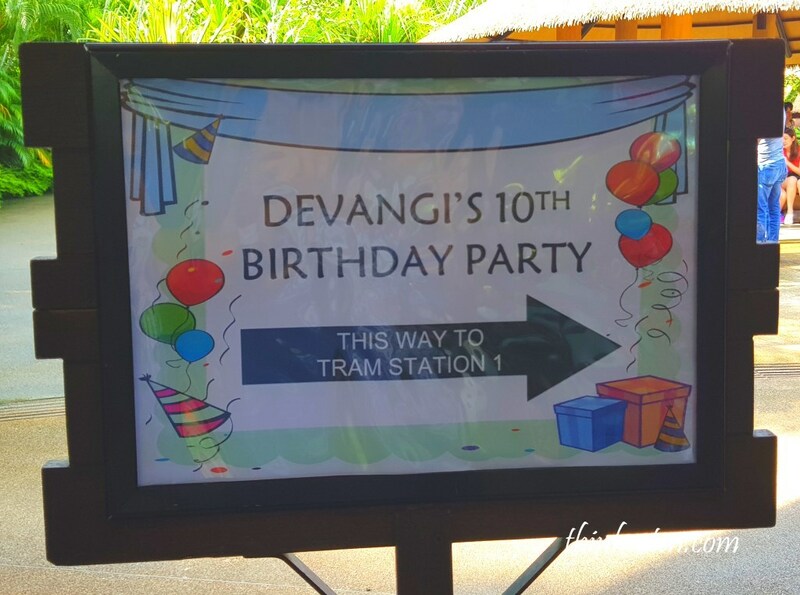 You also get a birthday song sing from a parrot, how cool is that? Parrots are too adorable? Can’t get enough? Click here book your ticket to have Lunch with the Parrots! There are few eatery place where you can get your food but my suggestion is to pack your own sandwiches & snacks as the queue in the eatery place is very scary, especially during lunch hour. 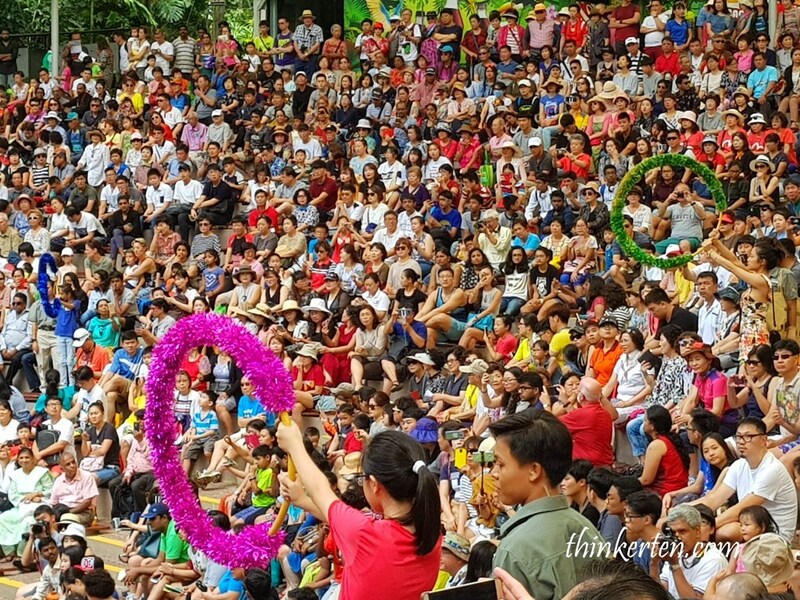 You don’t want to waste time on the queuing. 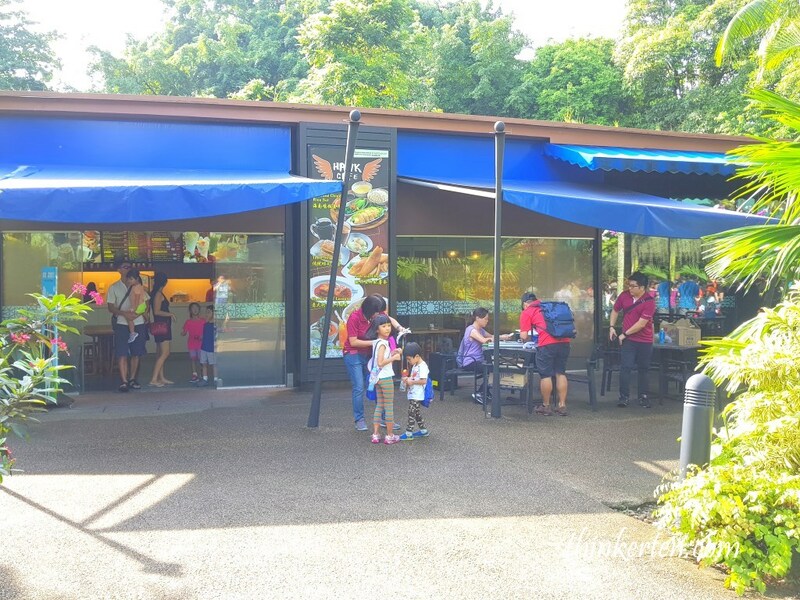 Plus the drinks at vending machine cost SGD 3.50 per bottle, quite expensive so it is better to prepare your picnic box and own healthy choice of drinks. Free water cooler is available! If you want some Tandoori Chicken or Vegetarian, do check Curry Garden, opposite the Hawks Cafe, they offer wide range of Northern and Southern Indian Cuisines. 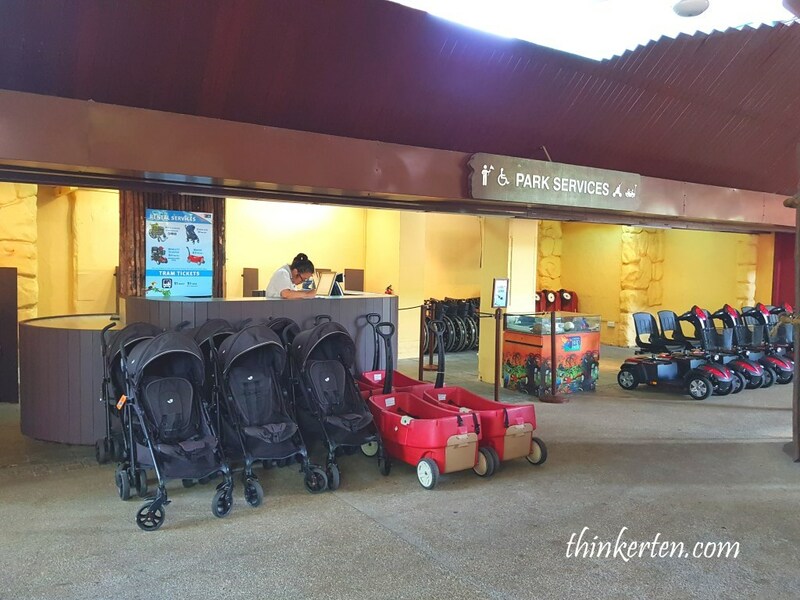 Renting of strollers, wheelchairs, mobility scooter and wagons are available at the service counter once you enter the bird park. Get your vehicle before you start explore. This big vessel is actually home to 100 of penguins. 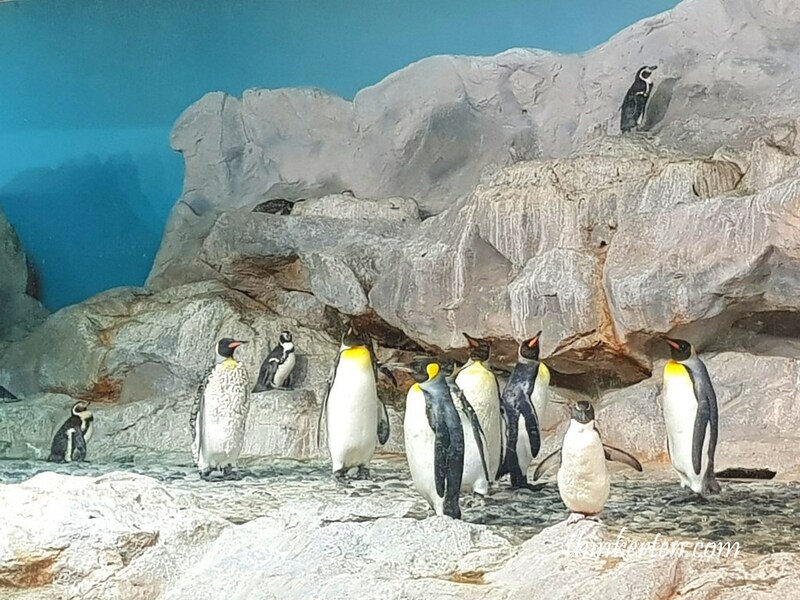 Best time to check out this little tuxedoed friends are during the feeding time – 10.30 am and 3.30 pm. Inside the vessel, it is a bit dark so be extra careful with the steps, especially if you are bringing young children and old folks. 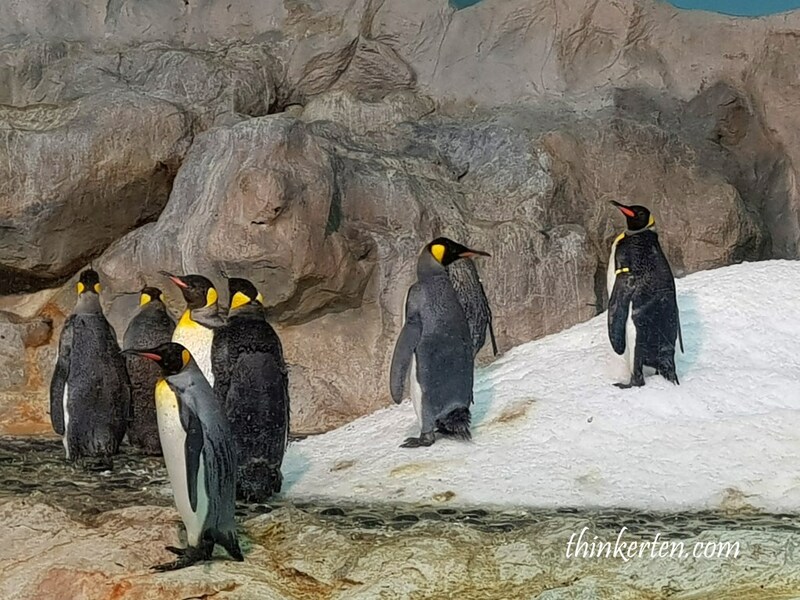 The climate-controlled den is home to 4 species of penguins, some are smaller and some are bigger and taller, similar to small human size. You will notice their wings are pretty small which won’t be able to fly (they lost their ability to fly million years ago) but use for swimming instead. 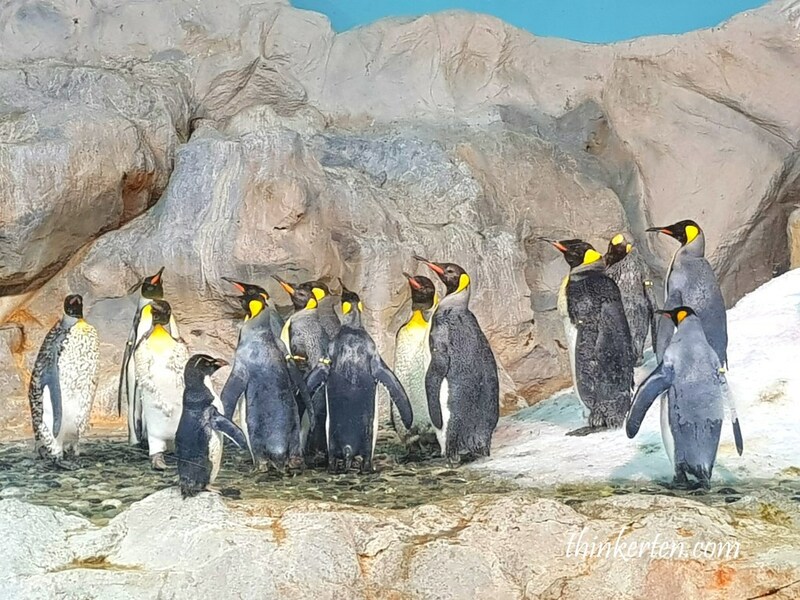 Emperor Penguins are the largest with height of 1.32 m, also are the main characters in the 2006 movie Happy Feet. 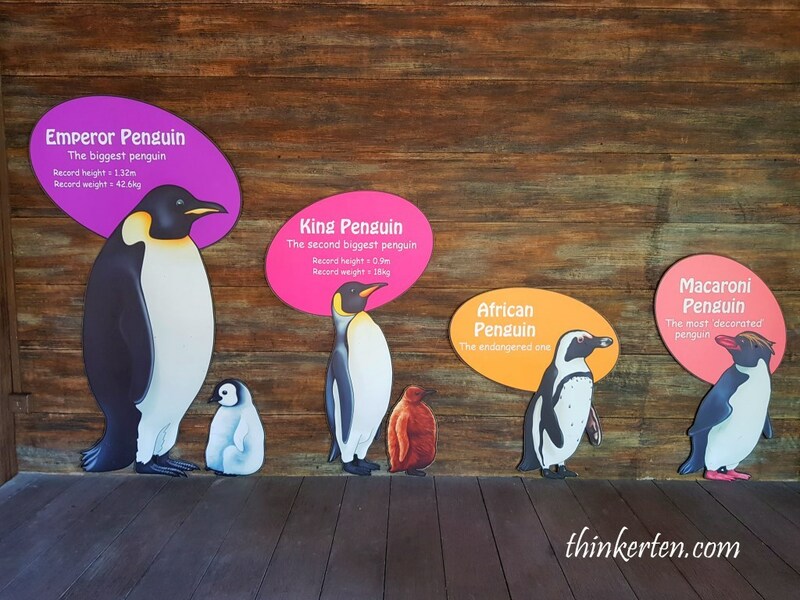 Second taller are King Penguin, the second largest 0.9 m. The endangered one is African Penguin and the most fashionable one is Macaroni Penguin. They were named after “macaroni dandies,” whose hairstyle was fashionable in the 18th century. 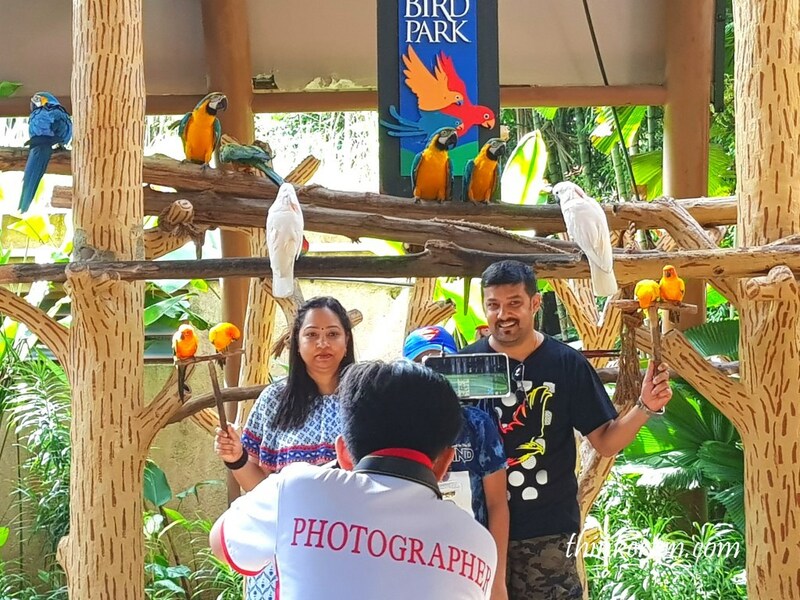 Professional photographer is there to help you capture your priceless moment with the colorful birds. Tired of walking? 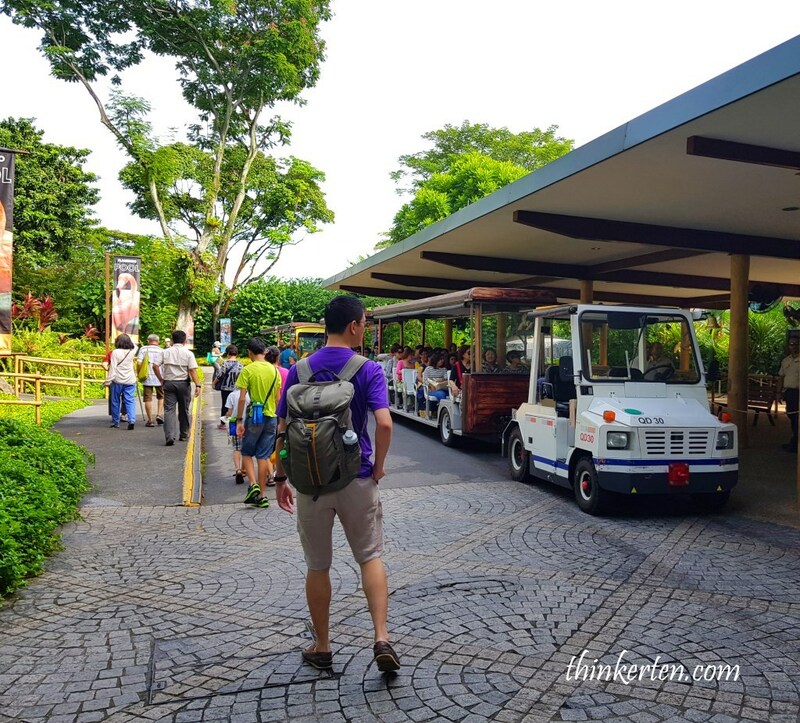 You can always ride on the tram at SGD $5.00 to explore at a more relax pace. 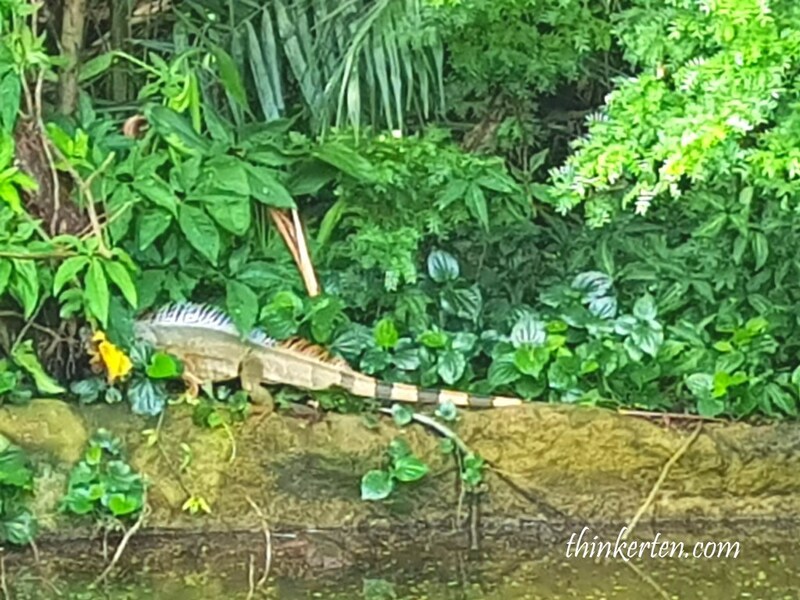 Over here in 20 hectare of Jurong Bird Park, you also get to see the 4 legged friend, Mr Chameleon crawling under the bushes. 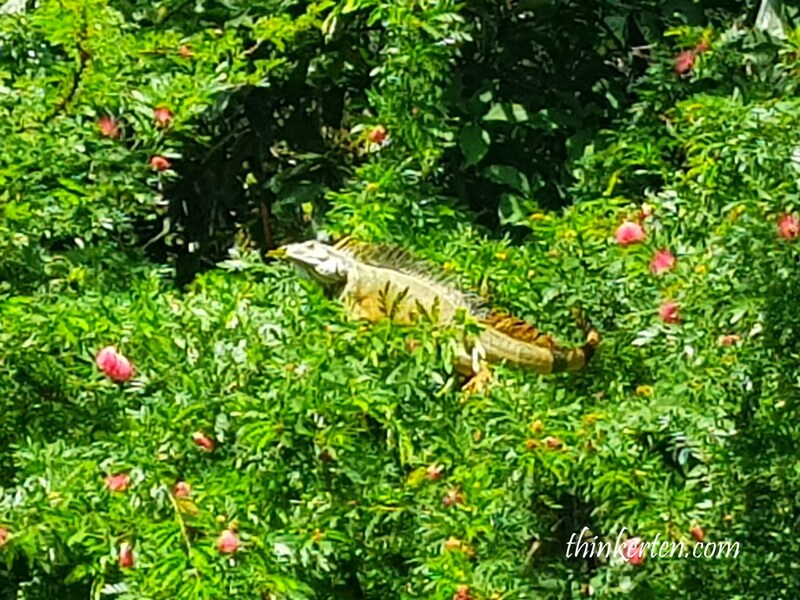 I spotted few reptiles crawling around slowly like a big boss. 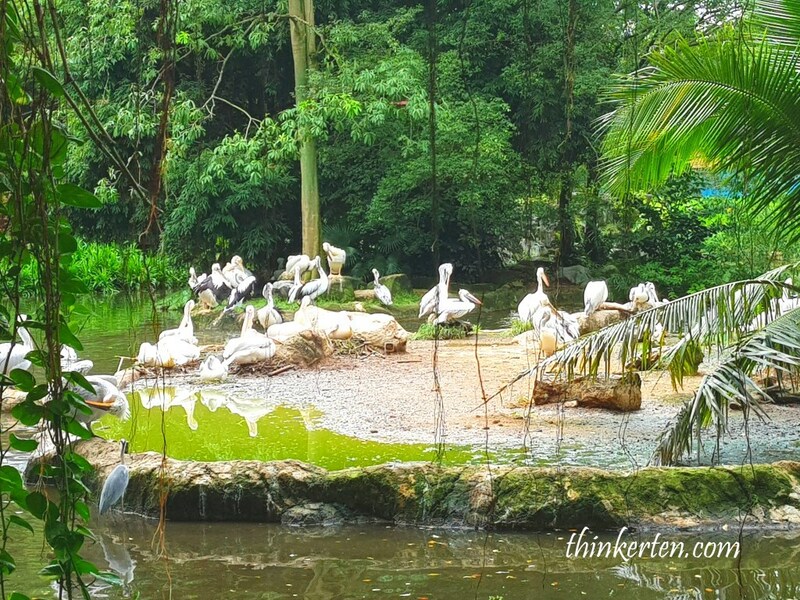 Why Jurong Bird Park was built? 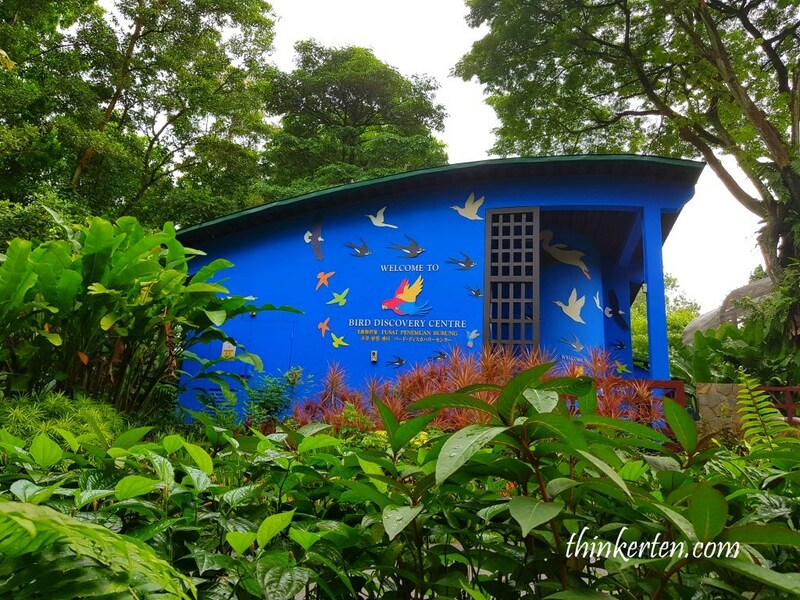 The park was built on the vision of former Deputy Prime Minister, the late Dr Goh Keng Swee who prefer bird park than the zoo at that time, simply because birdseed are cheaper than meat. 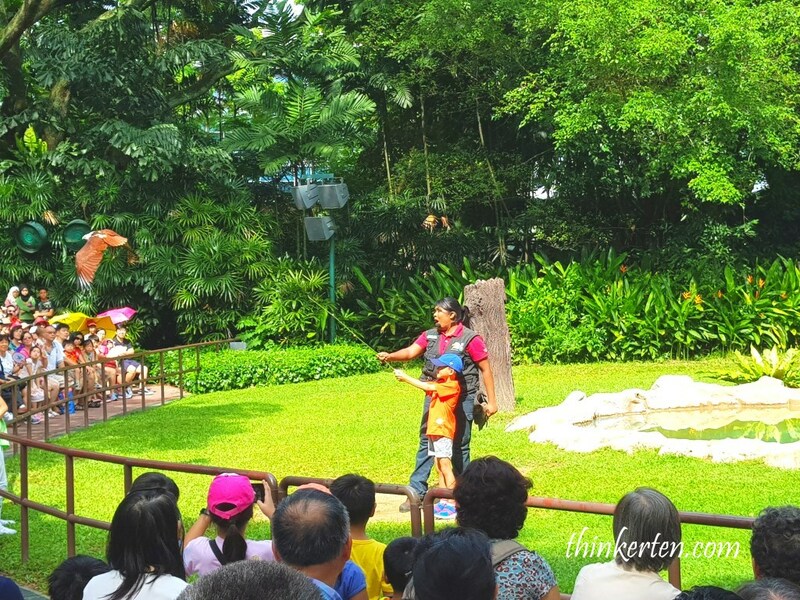 So, bird park (1971) was built ahead of zoo (1973). It is more costly to maintain a zoo which have to look after tigers and lions, eat many kilos of meats daily. 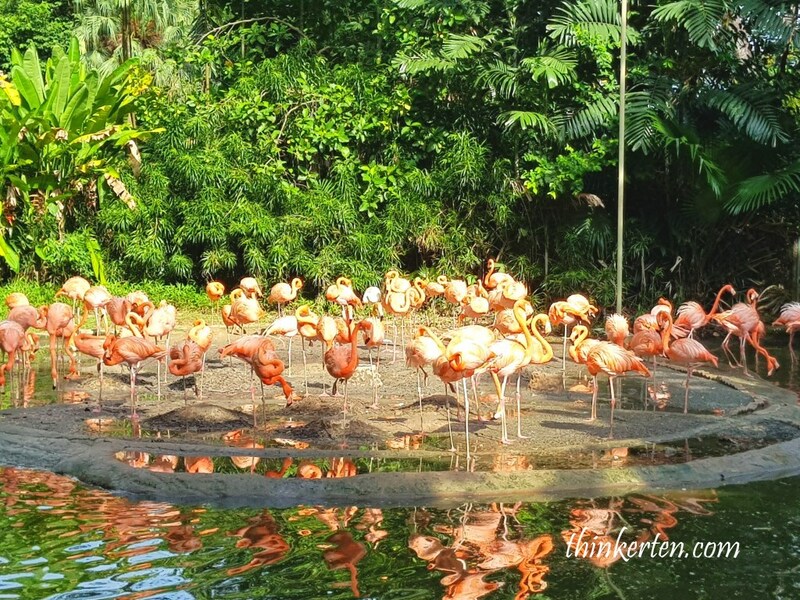 This is a great spot to capture the bright color pinky orange color bird. You are what you eat, this is so true for flamingo. They get their reddish-pink colour from special colouring chemicals called pigments found in the algae and invertebrates that they eat. Show runs at 10 am & 4 pm daily. 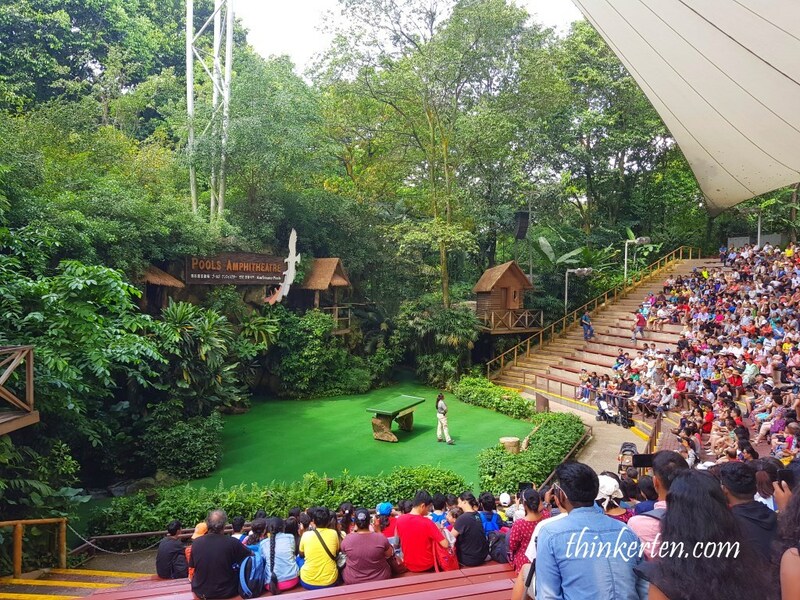 Don’t miss this as it is one of the highlight in Jurong Bird Park. 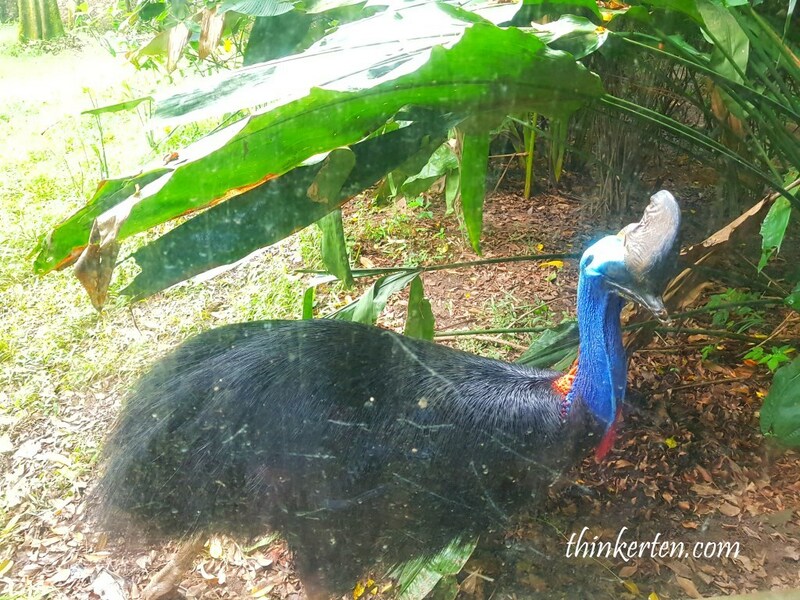 In this show, you get to see most of the serious and larger birds. 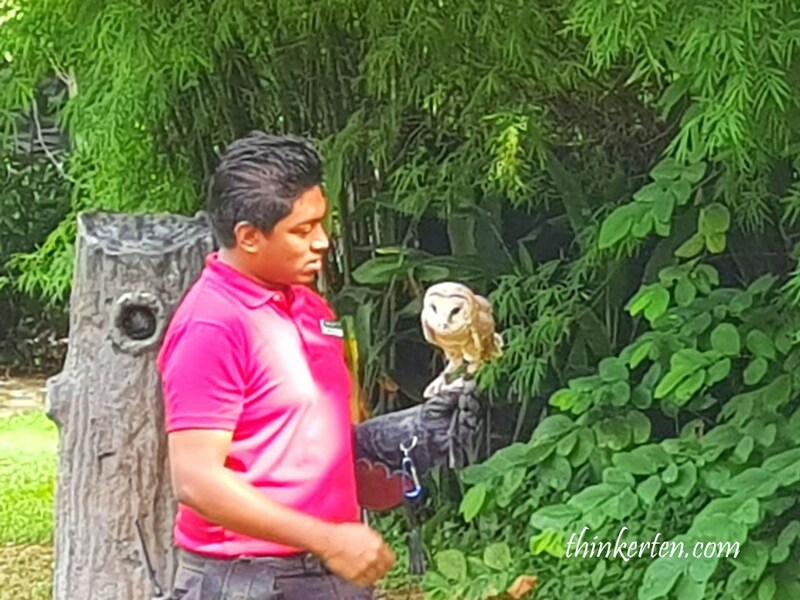 This owl, nocturnal animal can turn its head till 270′, actually quite interesting to see when it turns. A lucky young boy get picked and came down to the center of the stage to feed the hawk. 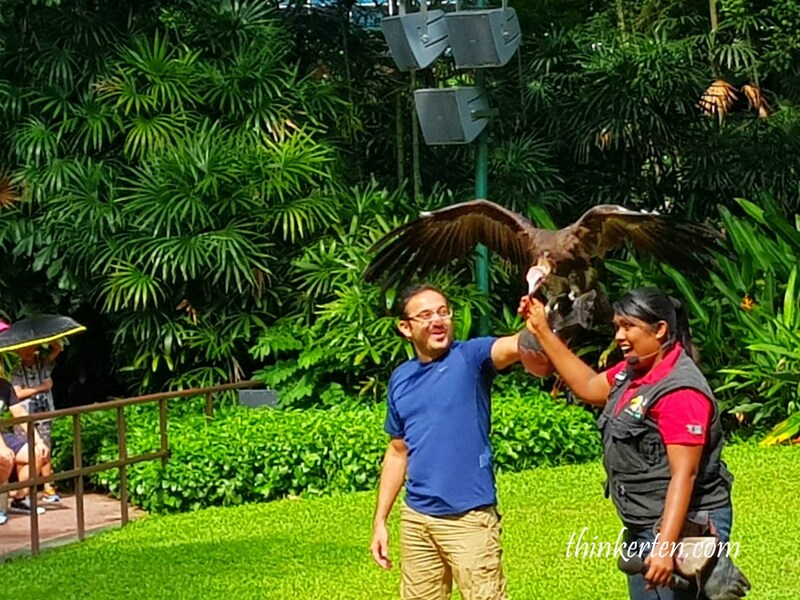 A tourists volunteered himself and go down to feed the vulture which weight at 2 kg but he cried it was quite heavy for him. Anyway, I could see he was having a great time! Vultures are actually harmless to human even though they look a bit creepy. They only eat on dead animals and do not attack human. Once you exit the show from Hawk Arena, there is a playground for children. 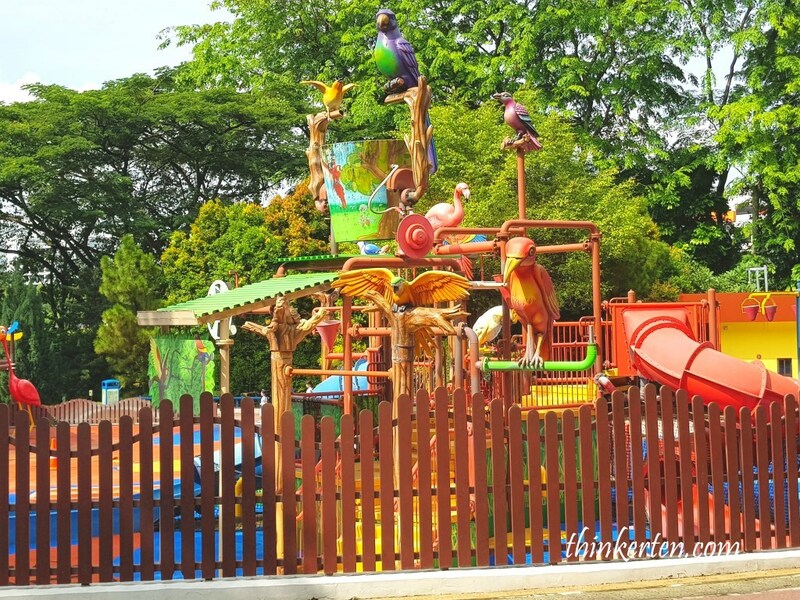 The playground offer both wet and dry play zones, do bring along a swimsuit or an extra set of clothes if you are bringing young children. Pelicans are famous for their throat pouch and some use their elastic pouches to catch fish. Check out this beauty and it’s special helmet. 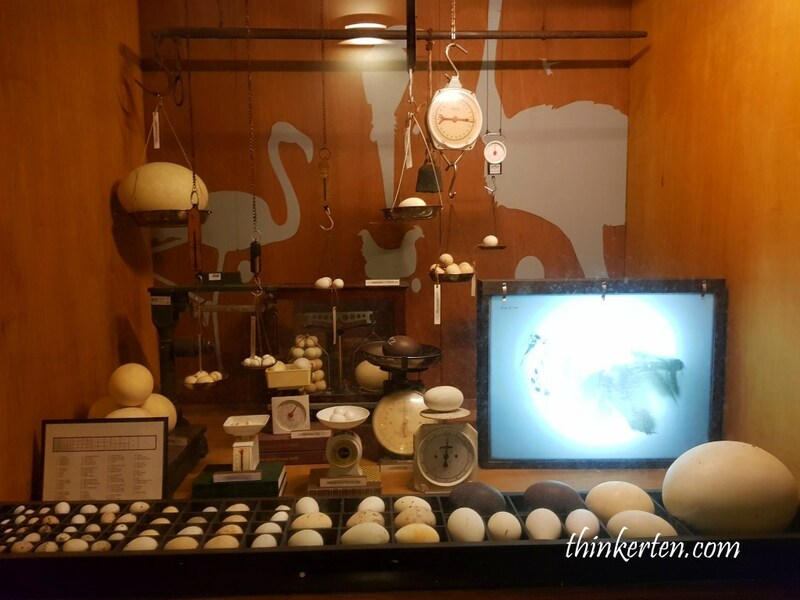 If you are bringing young children, do spend some time to learn about all kind of eggs and feathers in the center. 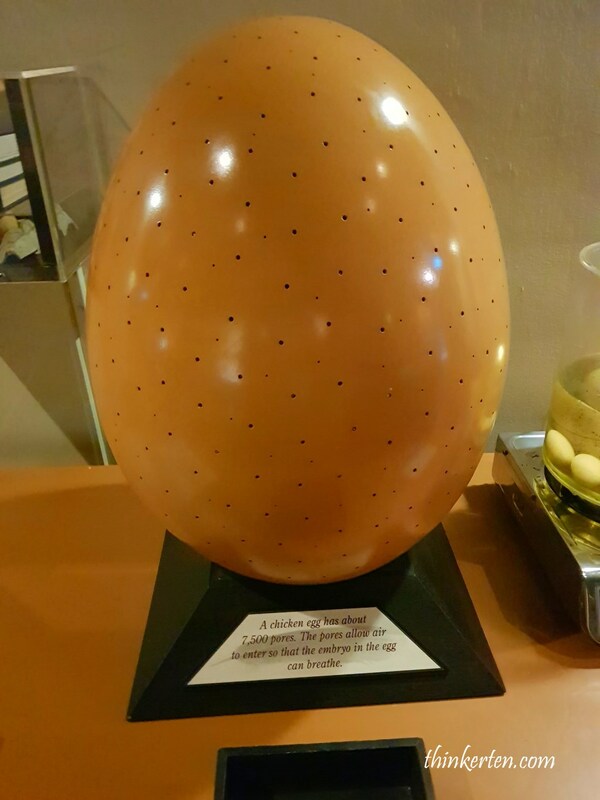 You get to witness the blue and green egg too! Show runs at 11 am & 3 pm daily. This is an interesting show where you get to see birds performing all kind of stunt. 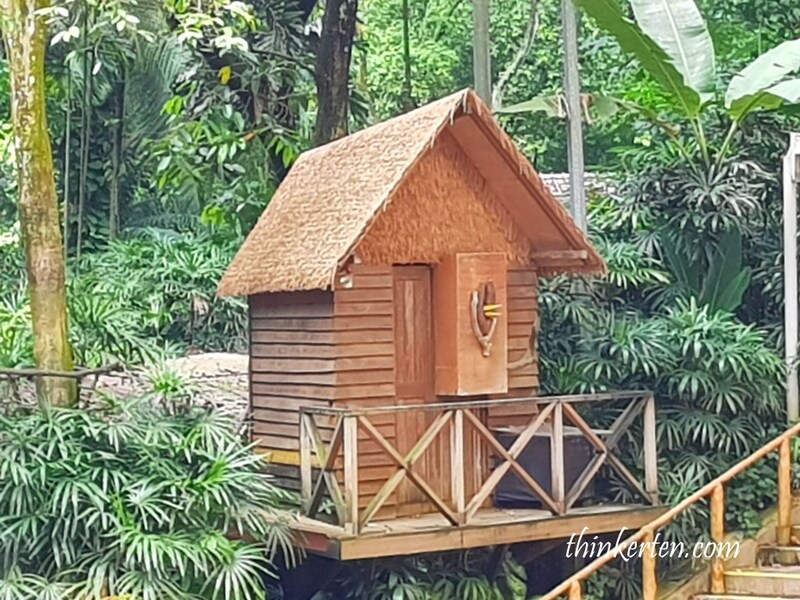 Hornbill wife is waiting for her husband to feed her. ( Picture above) . 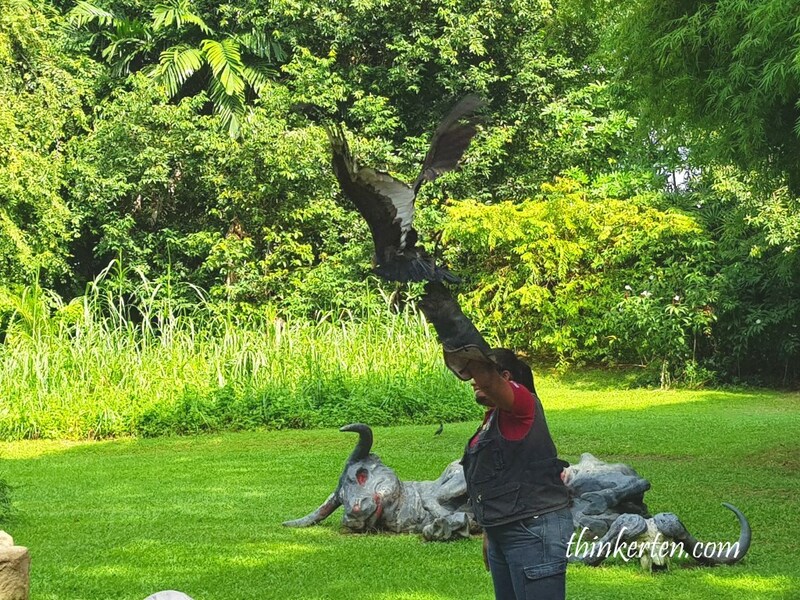 Hornbill husband is bringing food back to feed his wife. (Picture below). How sweet! Happy visitors volunteered themselves to be part of the bird show. 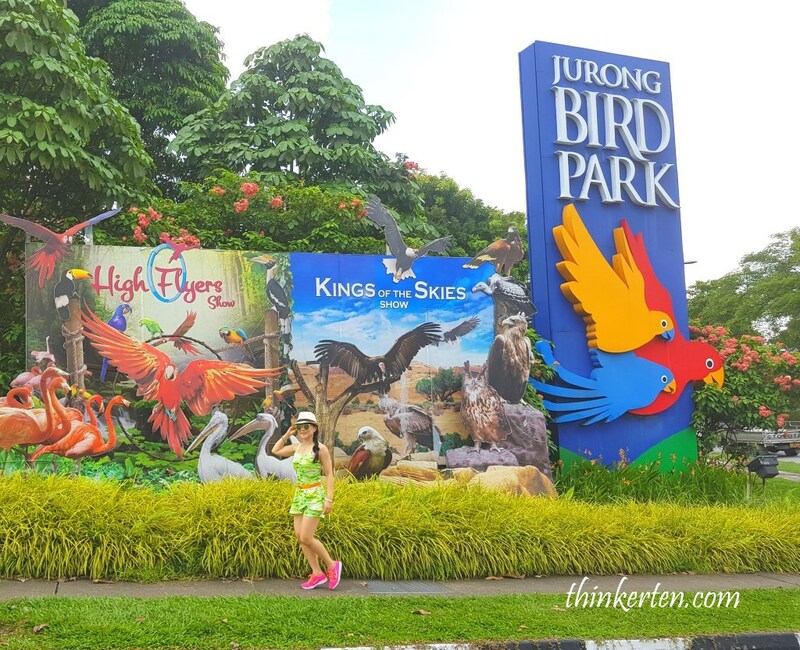 Check out the models at the runway in Jurong Bird Park! More birds! This one has a very special face mask at it’s face. 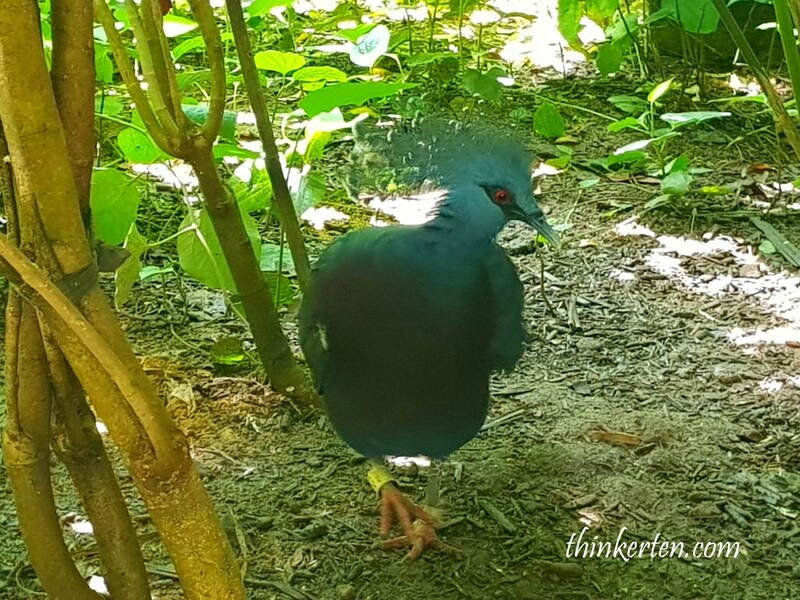 This bird has a afro hair style. 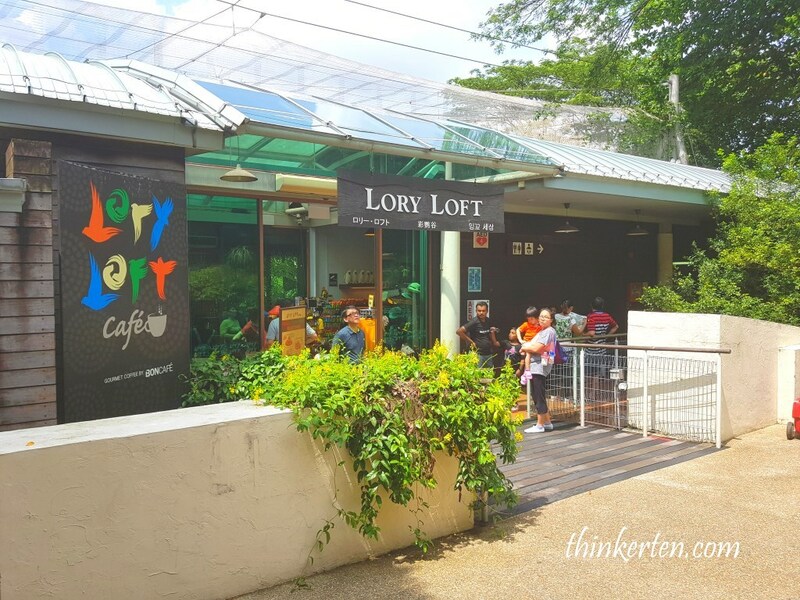 Lory Loft – My personal favorite! 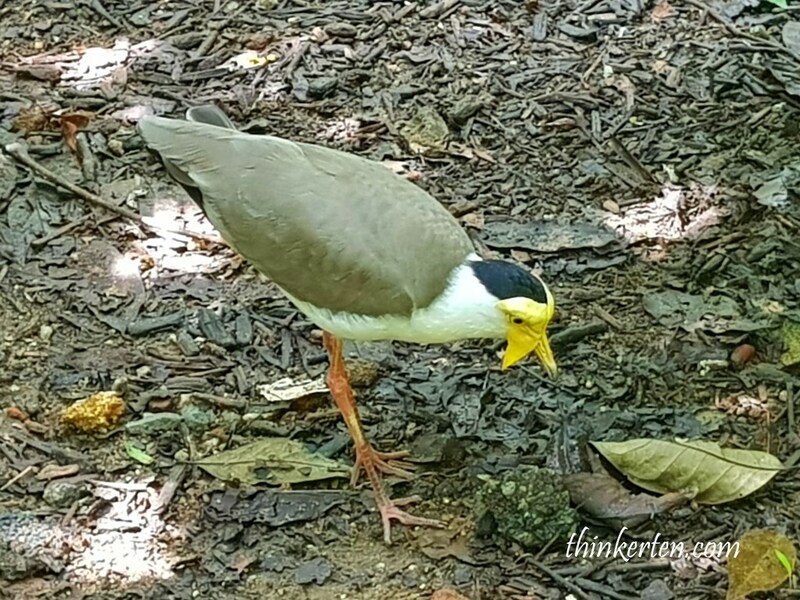 This is one of the highlight in Jurong Bird Park! 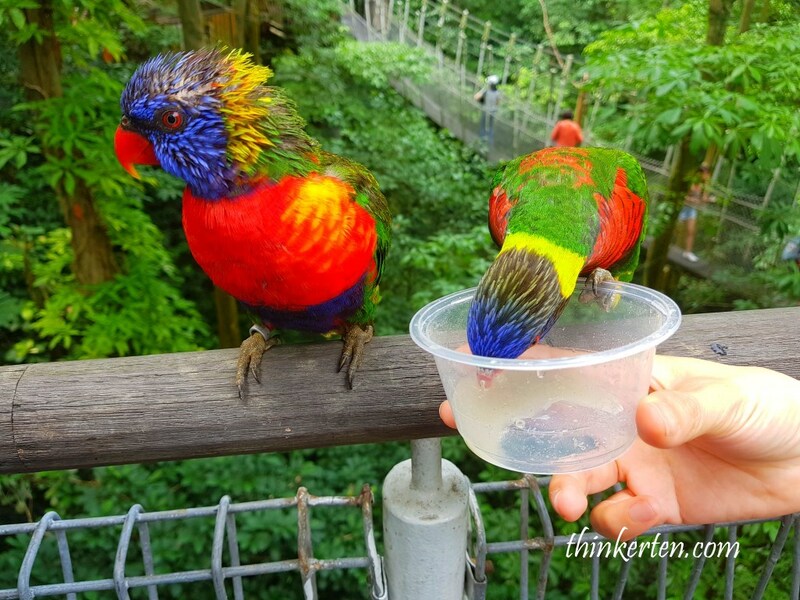 First, purchase the bird food, nectar mix which cost SGD 3.00 to feed these colorful feathered friends. 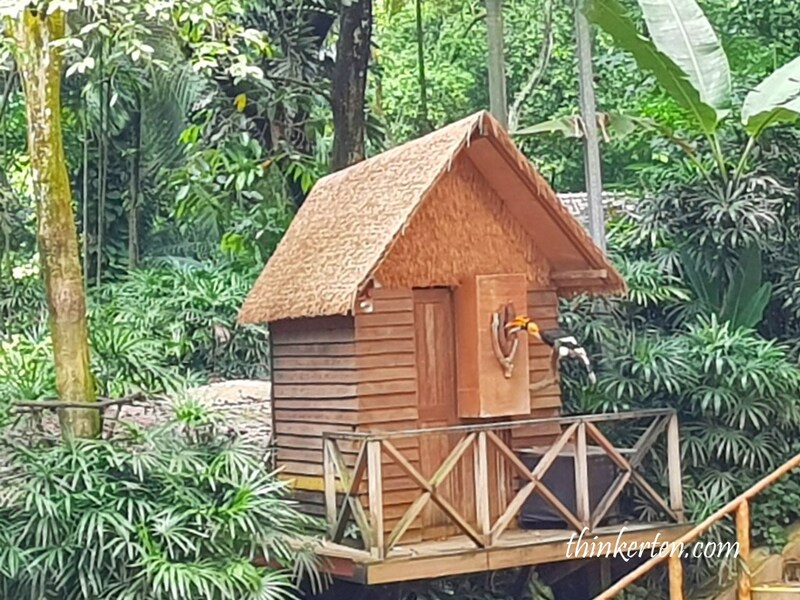 When you walked in Lory Loft, you would feel like you are at a rainforest valley. If you are wearing a green army camouflage outfit, then you are lucky! 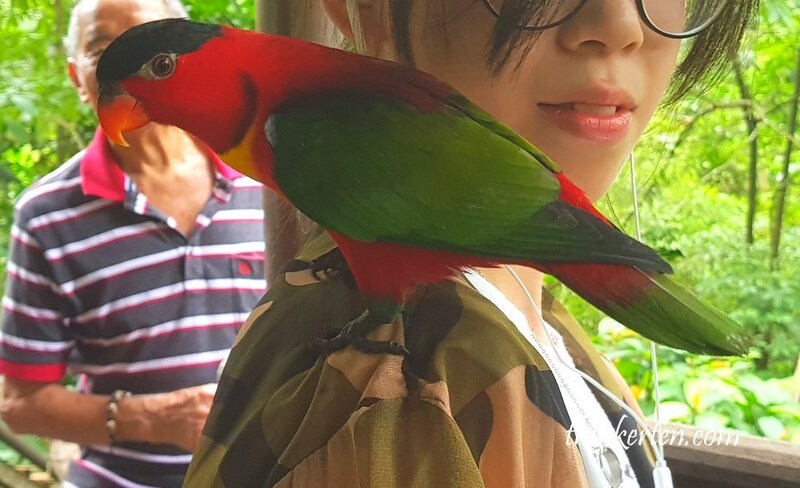 The birds will hop on your shoulders often as they thought you are part of the bushes or trees. 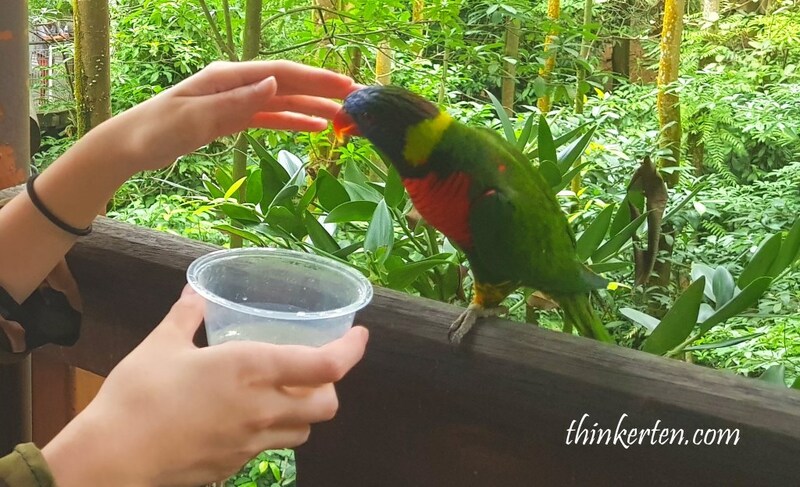 Don’t try to pat the birds, they don’t quite like it and will peck on you. It is quite painful! 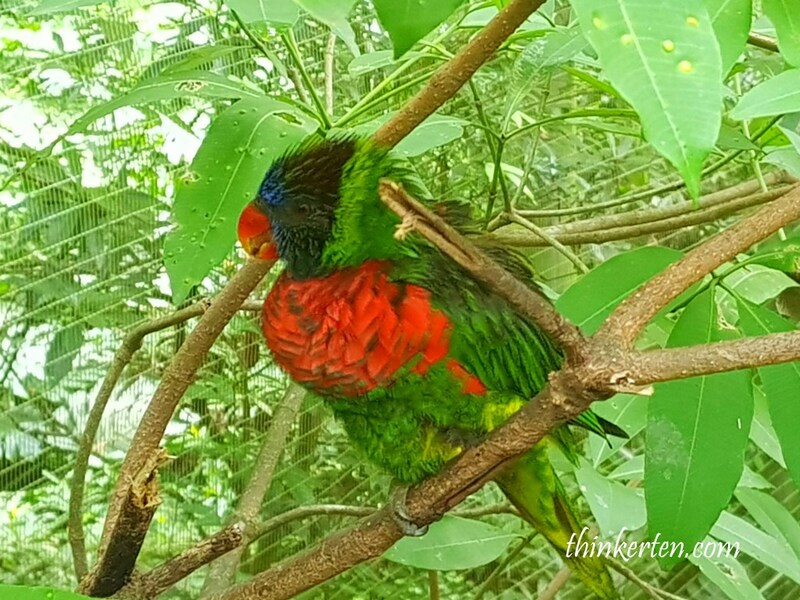 These lories and lorikeets seemed very full and well fed as there were many visitors before us has fed them. 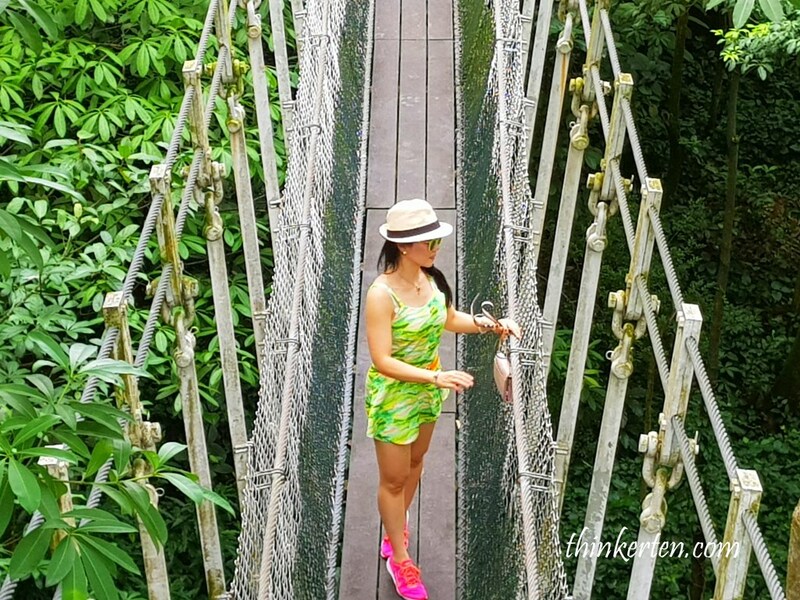 Go as early as 8.30 am as you get to fully utilize the whole day pass. Two bird shows not to be missed – at Hawks Arena and Pool Amphitheater. Prepare your own picnic box and drinks as the queue for food is quite long. 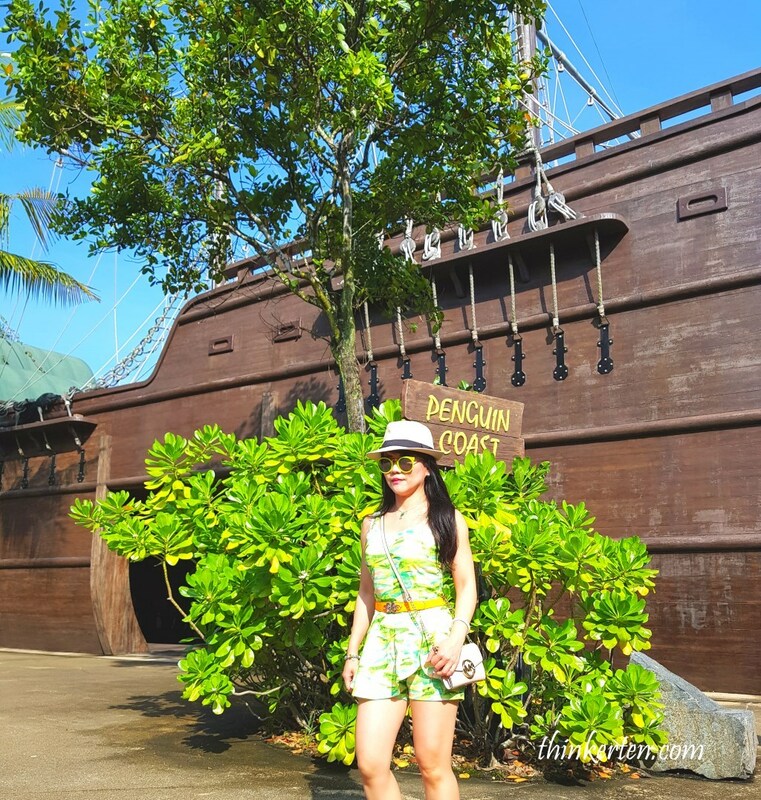 Bring along an extra sets of clothes for children in case children wanted to play in the wet zone playground. 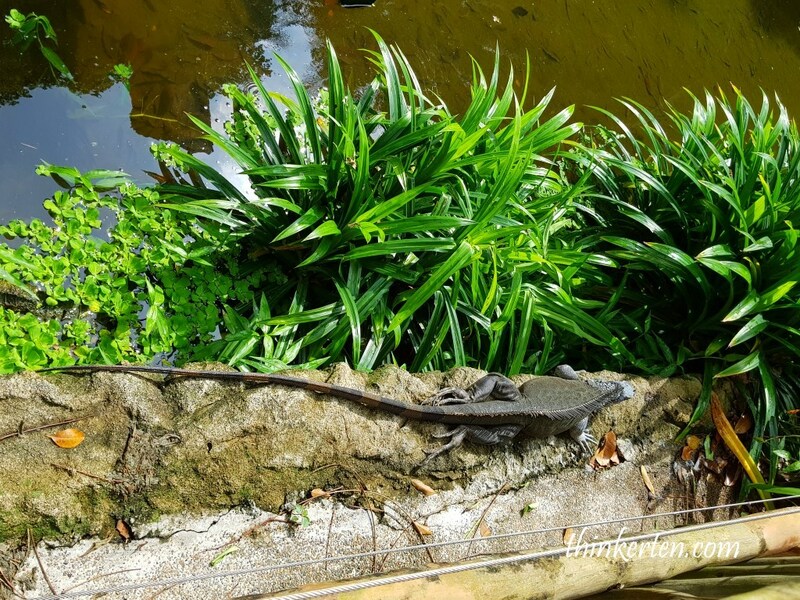 Singapore River Safari – Check out Jia Jia & Kai Kia Panda! African PenguinBird Discovery CentreBird Park PlaygroundBird with Helmet -Cassowary CasqueCelebrate Birthday at Jurong Bird ParkCurry GardenEmperor PenguinFlamingo PoolGreen Blue eggsHawks CafeJurong Bird Park AdmissionJurong Bird Park SingaporeKing PenguinKings of Skies Show at Hawks ArenaLory LoftMacaroni PenguinPelican CovePenguin CoastPictures with colorful BirdsPool Amphitheatre ShowRental Service at Jurong Bird ParkReptiles in Jurong Bird ParkRunway in Jurong Bird ParkTips for Jurong Bird ParkTram Service at Jurong Bird ParkWhy Jurong Bird Park was built?